The Friends of the Summit Free Public Library is a vibrant, diversified, grass-roots organization of local residents who take an active approach to supporting and enhancing the role of the library in our community. Join us today and help to fund new programs, new purchases, and new community outreach projects that benefit all residents of Summit and the surrounding communities! We are a 501(c)(3) organization, and your membership and donation dollars are fully deductible to the extent allowed by law. Our semi-annual 2-day jewelry sale last November and our Sunday afternoon pop-up mini-sale on December 9th were our most successful events yet! Our heartfelt gratitude goes out to all our shoppers, the volunteers who worked so hard setting up, assisting customers, and packing up afterward, and last but not least, to everyone who donated jewelry. We couldn't do this without your generous contributions! Missed those recent sales? The next one is coming up April 27 and 28-- just in time for Mother's Day and all your summer gift-giving occasions! We'd love to have you help at our sales-- no special invitation necessary! You can assist with the pre-sale prep as we sort, tag and price new donations; or with set-up, selling and dismantling the sale; even with publicity, which can mostly be done from home via the internet. Wherever you see yourself, we'd love to have you! Just become a member of the Friends and use the Contact Us page to let us know you'd like to participate! 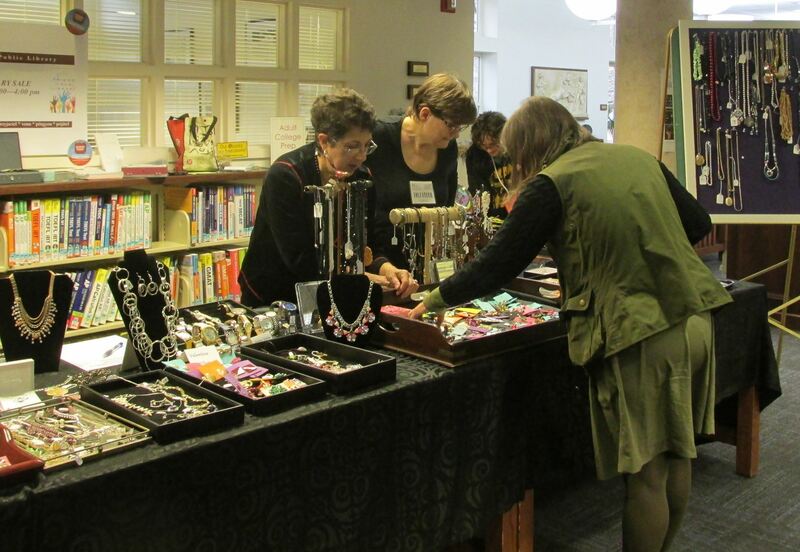 Volunteers assist customers at a recent pop-up mini sale. These local businesses support the Friends of the Library. Please show your appreciation by supporting them in return!